Thank you for your inquiry about hiring a piper. I require a $50.00 deposit and signed contract to book a performance. Once the amount is agreed upon, I will either fax or mail you a copy of the contract for review and signing. The remaining balance is paid directly to the piper at the conclusion of the event. If an unforeseen event should occur where the piper would not be able to keep the engagement, such as death, illness, injury, or any other act of God, I, Stanley Fontenot, will do my best to find another piper who will be adequate for the job. In the event that I am not able to find a piper, I will refund the full amount of the deposit promptly! This is the only time that the deposit will be refunded. 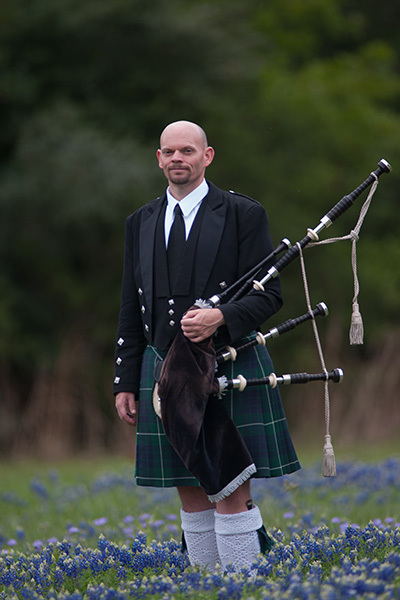 The piper will be in full highland attire. The piper will do his/her best to learn special music that is requested. If it is not possible, due to time or not being able to find specific music, the piper will suggest music suitable for the occasion.